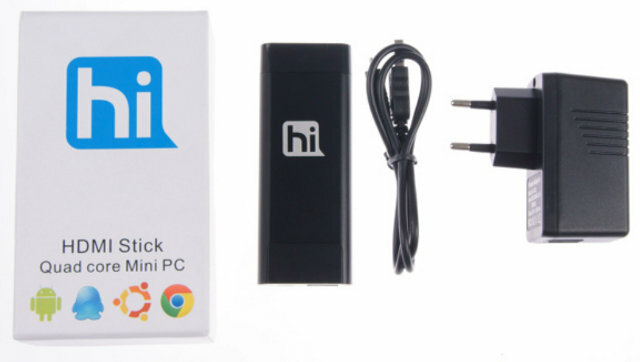 After many delays allegedly due to Freescale i.MX6 CPU delivery issues, Hiapad HI-802 mini PC appears to be now available for purchase on Aliexpress for $89 including shipping. This HDMI dongle features Freescale i.MX6 Quad, 1GB RAM and 8GB Flash. This Android 4.0 (ICS) mini PC comes with a 5V/1.5A power supply, a USB cable and an English user manual. It can support 1080p@60fps video decoding, as well as H.264 1080p@60fps & 720@100fps video encoding. Beside the powerful quad core Cortex A9 processor, what makes HI-802 really attractive is the openness of the platform, as Freescale released full documentation, as well as Linux and Android Source for i.MX6. This should allow the developers’ community to port diverse Linux distributions on top of Android and Ubuntu provided by Freescale, without spending time reverse engineering the SoC specs like is the case with Chinese SoC from companies such as AllWinner or Rockchip.